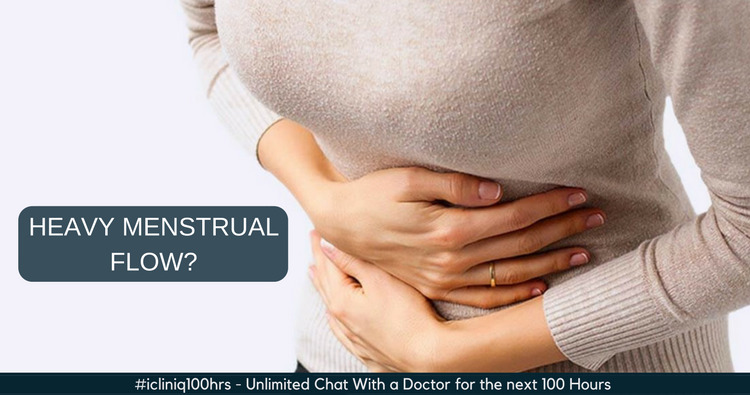 iCliniq › Ask a doctor online › Answers › Obstetrics and Gynaecology › Heavy Bleeding › How to manage heavy menstrual flow? Q. How to manage heavy menstrual flow? I have been suffering from heavy menstrual flow for the past 1.5 years. Around six months, I had heavy flow with clots. Now, I have been menstruating for the past 20 days continuously with heavy flow and clots. My current medication includes capsule Gynae CVP, tablet Augmentin and capsule Zevit. I am also having a urine infection now. For this, I am drinking plenty of water and other fluid. Please help. • Post fibroids operation there is gradual deterioration in health. What to do? • Uterine fibroid detected during sixth week of pregnancy.What do I do? • Please suggest an antibiotic for recurrent urinary tract infection. You are losing blood heavily. Kindly upload your reports as well. Since you are bleeding for the last 20 days continuously, first we should try to stop this. I suggest tablet Meftaris (combination of Tranexamic acid and Mefenamic acid) one tablet thrice a day for three days and also tablet Regestrone (Norethindrone) 5 mg thrice a day for 5 days. This will certainly control the bleeding. Also, start some Iron preparation if it suits you. By that time send your ultrasound report. It can be a fibroid uterus or abnormal uterine bleeding due to endometrial hyperplasia and need to be followed further. Also get your CBC - complete blood count, coagulation profile and thyroid function tests done. For UTI (urinary tract infection), you are already taking antibiotics. After finishing its course, get a routine urine examination again to see if pus cells are present or not. I have attached the ultrasound report for your reference. I have seen your ultrasound report (attachment removed to protect patient identity). There is a small fibroid, which is not the cause of heavy bleeding. Do not worry about the simple cyst in the ovary. The inner uterine lining is quite thick and you need to get one endometrial biopsy done from your gynecologist. This will serve two purposes. One it will stop bleeding and the other we can get the sample and send for histopathology to see the type of hyperplasia and this will decide the further line of management. Before test take only tablet Meftaris to reduce the amount of bleeding. Consult your doctor, discuss with him or her and take the medicine with consent. Another thing is that there is a significant amount of residual urine, which might be causing recurrent UTI. Consult your doctor for a physical evaluation.